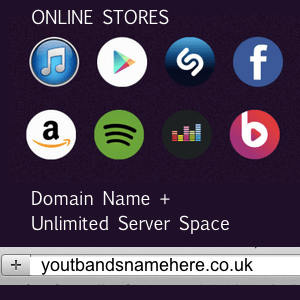 Get your music on all the major online stores and a co.uk domain name and unlimited serverspace including email with the latest versions of WordPress / Joomla installed with HTML5 audio player installed and ready for you to sell your music online including Facebook. I would need your digital music file in CD quality, title of track and artwork for your release. – Choose a release date to get maximum impact. You receive all the royalties and have full access to your sales report and website statistics. You deal with me and nobody else so no faceless company so please don’t hesitate to contact me for more information. You must own all the copyright of the music you submit to the online stores. Once your music is submitted it can take up to 10 days before your music is available online to buy. Domain Name & Server Space for one year from date of setup and can be renewed each year for £40 if required. Please fill in this form and I will contact you as soon as shortly. Steamroom Media is proud to present : Movin’ On – Steamroom Music Ft. Julie Dillon.